This recommended practice (RP) of AACE International defines the integrated analysis of schedule and cost risk to estimate the appropriate level of cost and schedule contingency reserve on projects. The main contribution of this RP is to include the impact of schedule risk on cost risk and hence on the need for cost contingency reserves. Additional benefits include the prioritizing of the risks to cost, some of which are risks to schedule, so that risk mitigation may be conducted in a cost-effective way, scatter diagrams of time-cost pairs for developing joint targets of time and cost, and probabilistic cash flow which shows cash flow at different levels of certainty. The methods presented in the RP are based on integrating the cost estimate with the project schedule by resource-loading and costing the schedule's activities. The probability and impact of risks/uncertainties are specified and the risks/uncertainties are linked to the activities and costs that they affect. 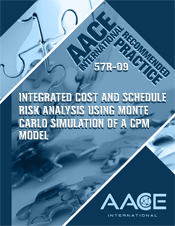 Using Monte Carlo techniques one can simulate both time and cost, permitting the impacts of schedule risk on cost risk to be calculated. These methods can be used both by the contractor and the owner. The contractor usually has a more detailed schedule and understanding of resource allocations used to put the costs into the schedule. The owner may use a more summary schedule and summary notion of resources, but still is able to put the costs into the schedule at a summary level. In fact there are many risks to the owner that do not affect the contractor as risks. Also, the contractor will not know about some of the owner's risk, such as having insufficient resources. In the case of joint venture owners the JV is often a marriage of convenience of disparate organizations with risks arising from different goals and methods. This RP is consistent with the Total Cost Management (TCM) Framework Section 7.6 Risk Management. In particular, the entry in the TCM Section 7.6.2.2 Identify and Assess Risk Factors, highlights the fundamental “risk factors (or drivers) are events and conditions that may influence or drive uncertainty (i.e., either opportunities or threats) in asset or project performance.” This RP uses the same approach, starting with the RP section Simulating Using Risks as Drivers and illustrating the method in the case study.